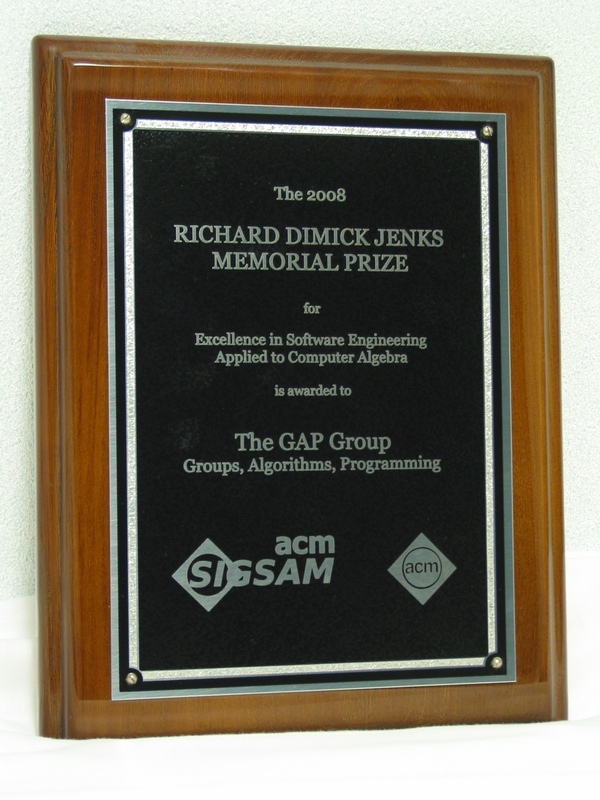 The 2008 Richard Dimick Jenks Prize for Excellence in Software Engineering Applied to Computer Algebra has been awarded to the GAP Group. GAP (Groups, Algorithms and Programming) is a free computer algebra system for computational discrete algebra, with particular emphasis on computational group theory. GAP provides a programming language, a library of thousands of functions implementing algebraic algorithms in the GAP language, and large data libraries of algebraic objects. The system, including source, is distributed freely and can be easily modified and extended for special use. GAP was started at Lehrstuhl D für Mathematik, RWTH Aachen in 1986. After 1997 the development of GAP was coordinated in St Andrews. At present, there are GAP Centers in Aachen, Braunschweig, Fort Collins and St Andrews. A check for US$1,000 and the above plaque was presented at the 2008 International Symposium on Symbolic and Algebraic Manipulation (ISSAC '08). This took place at the Research Institute for Symbolic Computation, Johannes Kepler University Linz, Haganberg, Austria in July 2008. The prize was received by Steve Linton, Alexander Konovalov and Frank Luebeck on behalf of the whole GAP development and support community. Four plaques were awarded, as the one shown above, to be kept in the four current GAP centres.